Often there's a story at the intersection of life and art. An interpretation of Nature in Trumpian times. 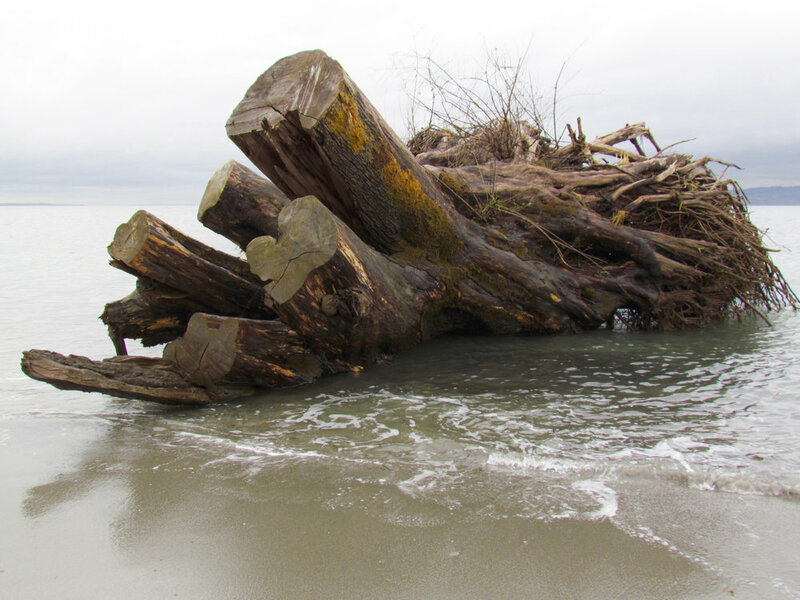 November 2017, on a stormy day, the tide swept this enormous driftwood ashore. It damaged a neighbor's boat launch that had withstood the elements for decades. Unlike wrack which provides food and shelter for a variety of beach inhabitants, this driftwood sits ominously in the sand, providing no benefit except as an occasional perch for shorebirds. We watch it every day, noticing how its appearance is altered by changing light and shifting tides. Probably it will be moved again by the same natural forces that brought it to our beach. Wherever it finally comes to rest, over time it will decay and disappear. 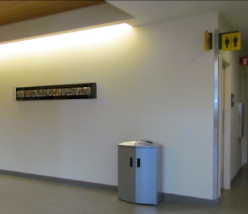 On the first floor of Kaiser Permanente Medical Center in Puyallup, WA, at the corner of Restrooms and Elevators, there's a colorful assemblage. Like much of my work, its creation was unconventional. In 2011 a piece of packing material came into my life, and as soon as I saw it I imagined the structure as tiny doors and windows, containers for ephemera. I used strings to suspend it from the studio wall and began filling the spaces with bits of things I'd saved over the years. Each object I added to the structure rekindled a memory. The process felt akin to an archeological dig, hence the title: Excavation. This is the way my project, Lavina's Gift, began. The first time I printed these pictures, I realized the negatives were flawed and would never yield conventional photographs. Rather than discarding the prints, I bound them with a plastic spine and flipped through the pages again and again. For many years, this make-shift book was the only form of the complete story of Lavina's Gift. I carried it everywhere. It became a Book of Hours for me. The images revealed a story about the rhythm of life and connectedness. I imagined Lavina to be the personification of life force, and I attributed meaning to many elements in the pictures. In 2010, after having the original negatives digitized, I began working with elements of the story again. The complete story is now also a slideshow . My passion for photographic processes and possibilities began with a tourist snapshot taken in Victoria, BC, Canada. It was a street scene with brick buildings and colorful flower baskets. Months later, in the darkroom, I discovered compelling imagery I'd not noticed when I took the picture. In 1976 I was learning to print and I knew that when a negative was nearly transparent the detail was lost in darkness. Looking through the lens of my enlarger I noticed, within a transparent place on this negative, suggestion of a shape below street level. I was intrigued and wanted to be able to see and print the details. My curiosity resulted in learning how to create a paper negative and eventually to printing this image I called Sleeping Man. The grains of silver on my film had held the memory of something I'd not noticed.